It only seems fitting that with my 27th birthday occurring next week to write about another birthday dinner I had earlier this year. In June I went for dinner at Boralia to celebrate one of my favourite people in the world’s birthday: Cynthia. Boralia is a restaurant that is serving historically inspired dishes representing the cuisines of Canada’s aboriginal population and early settlers. You won’t see any stereotypical representations of Canadiana in this restaurant. There are no Hudson’s Bay blankets, or stripes of colouring drawing on this imagery. There is no overuse of antlers and pelts adorning the walls. There is a large mural illustrating a lush green forest, and natural materials are used throughout the restaurant. The simplicity and use of other iconography to conjure images of Canada is welcomed and prepares you for the redefining of Canadian cuisine and culture. We started with the L’éclade and Red Fife Levain Bread & Cultured Butter. The interesting thing about the menu at Boralia is that each item is given a date at the end of the description, informing the diner of the historical period that this dish is from. The L’éclade is a dish that was brought to Canada by Samuel de Champlain and was a favourite among his crew. The history nerd in me loved this attention to detail and historical accuracy. The presentation of this dish is beautiful. The bowl of mussels is brought to your table covered in a bell jar. The server slowly lifts the cloche to release fragrant smoke that has been infused with pine needles. The smoke slowly dissipates in the air but the smell and flavourings of pine are maintained in the butter. 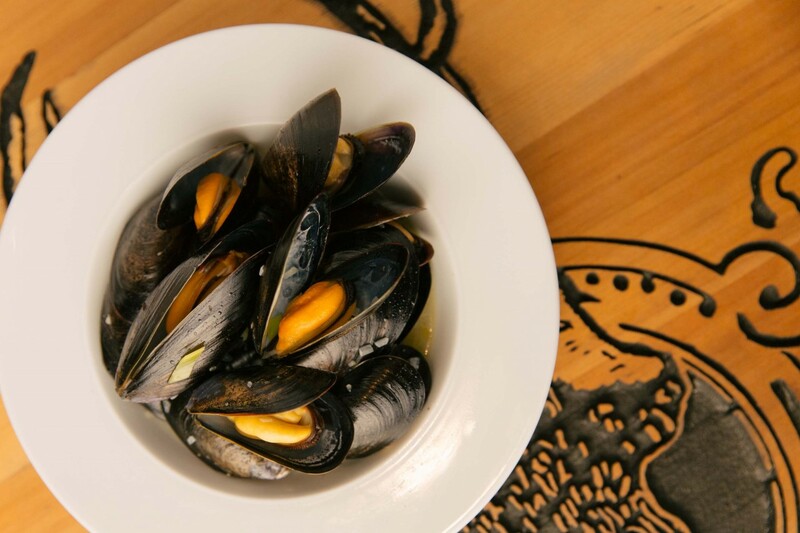 The mussels are tender and salty, infused with smoky and floral tones from the pine. Ordering the side of bread is a must but not for the bread itself; rather to soak up all the delicious butter pooling at the bottom of the bowl. Next we ordered the Pigeon Pie. Pigeon Pie with roast squab breast and asparagus c.1611. If you have ever walked in Toronto with me, you would know of my hatred of pigeons. They are dirty and messy and I cannot tolerate people who feed them. The fact that I could eat my animal enemy was enticing. The pie crust was buttery, flaky and crunchy: it melted over your tongue as if it was purely made of butter. It was a perfect pie crust. The filling however, was not worthy of being encased by a crust this good. The filling was not bad but it was nothing impressive. It was a typical meat pie filling: carrots, pies and a thick gravy. The taste and texture of squab was not apparent in this pie. The squab breast on the side was the representation of the meat that I was looking for. The breast was seared on the outside, creating a crunchy shell around the whole piece that locked in the juiciness of the meat. The meat was tender but a bit gamy; squab tastes and feels like a mixture of duck and chicken. It has the richness and flavour of duck but the softness and almost creaminess of chicken. I would be perfectly happy with an order of the duck breast without the pie. Next we had the Pan-Roasted Elk. Pan-roasted Elk with wild rice-crusted egg, cranberry gastrique, burnt onion, and radish. I wasn’t blown away by this dish. The cranberry gastrique was my favourite component of the plate. The tartness was a nice accompaniment to the rich, gaminess of the elk. The elk was slightly tough and did not have much flavour beside the gaminess that is typical of elk. The wild rice-crusted egg was good. The rice added nutiness to the dish that gave it a woodsy, more rustic taste. The egg oozed over the elk and help distract from the toughness of the meat. To finish we ordered the Louisbourg Hot Chocolate Beignets. Louisbourg hot chocolate beignets with spiced chocolate ganache, beer batter, and lemon sugar c.1795. These were delicious. This is one of the simplest but best desserts I have had at a restaurant. The beignets were hot from being recently fried. They were the right balance of fatty, savoury and sweet. The chocolate ganache was warm, rich, silky and viscous: it slowly oozed out of each beignet with every bite. It was the best chocolate I have ever eaten. The lemon sugar added a light, citrus flavour to the decadent beignets and made them not taste quite so heavy. I would recommend a visit to Boralia. It is a nice, upscale taste of home. We are often criticized for not having a national cuisine but I think Boralia is the start of that movement.